A sparkling solitaire diamond ring luxuriously crafted from 18ct white gold, presenting a platinum 4-claw setting. 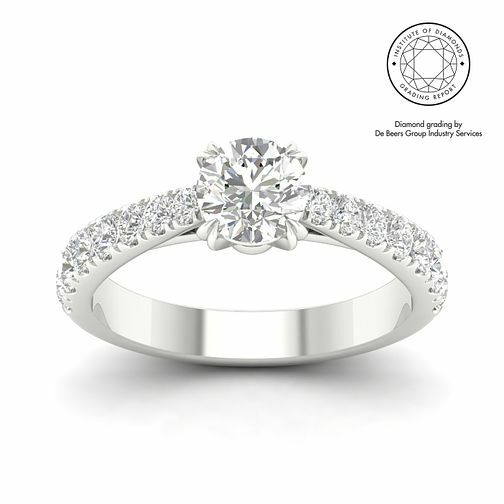 This contemporary touch offers more security for the divine round diamond centrepiece. The shining doesn't end there, with shimmering set stones adorning the shoulders for extra indulgence. The dazzling diamonds have been certified by De Beers Group for colour and I2 clarity. A classic ring boasting a total diamond weight of 1.50ct. Elegant diamonds to express your love, certified by De Beers Group.